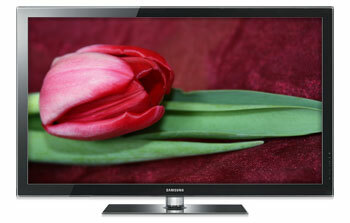 The Samsung PN50C590, with Mega Dynamic Contrast Ratio makes sure every frame is saturated with dense, rich color. Samsung is also ENERGY STAR compliant so you are assured that your 50 -inch plasma HDTV is helping the environment by using less enery while saving you money. Get a truly cinematic experience with Cinema Smooth and Movie Mode Technologies that create an amazing image and color temperatures that close mimic real films seen at movie theaters. 2,000,000:1 Dynamic Contrast Ratio Difference in luminosity between brightest color (white) & darkest (black) over time. Higher ratio means more contrast. .001 ms Response Time Speed at which pixels can change color. Lower response times mean better motion image reproduction. 16:9 Aspect Ratio Ratio of the width of an display to its height. 16:9 is the universal standard for high-definition TV. 15 Watts x 2 Audio Channels Sound power and signal emitted from a TV's speaker, as measured via Root Mean Square (RMS). Game Mode Mode in which a user can play video games on an LCD television. 1 RF Input Radio Frequency socket that accepts analog signals. Often used to connect lines for cable TV.